Sorry I’ve been sketchy lately. I returned home from California to be faced with a sad new reality that will mean some major changes have to happen. A situation that causes daily stress, and will for an indefinite period. If prognoses are correct, there won’t be a happy ending. On top of that Major Situation, stressful Minor Situations seemed to pile up on top of each other. Every day. Layer upon layer of stress and anxiety. Things heating up to the boiling point. And I was anxious about impending cataract surgery. Another sign of impending age. I did what I often do in such situations. I let those heavy layers weigh me down until I found myself in a fast southward spiral to The Pit. Instead of “Good morning, Lord!” it was “Oh Lord, it’s morning!” Each day I prayed for enough energy to just-get-through-it. I resorted to my favorite unhealthy coping mechanisms. Servpro had come and done their thing, including ripping up all the carpets. I was scheduled to meet the carpet people the week that Katherine broke her leg. Obviously, that had to be postponed and rescheduled until I returned from LA. It was just about the last thing in the whole world I had time or inclination to do that first stressful week back. So Miss Bad-Mood-Betty hauled herself up there in the family ‘truck’ (car broken! ), and pouted. Looked at all the happy Before Pictures, and had a Pity Party about how life has turned out. I had to spend the night after the carpet guys finished (late), so the handyman could come in the morning and help me move all the furniture back. While there, he pointed out several other things that are in need of immediate repair before we get a Property Condemned sign on the door. Wearily, I hauled stuff back up to the ‘truck’ to head home. It was a hideously humid, hot day. Bad words were in my head. If anyone had been around to hear, they might have come out. The ‘truck’ was too close to the bramble. I got scratched trying to load things up. In frustration, I pushed back some branches. In 15 years of owning the property, we have never seen a single grape. There were decaying grape arbors on the lot when we bought it. Evidently, the previous owners had high expectations for pursuing a gardening hobby at the lake. But nobody goes to the lake to weed and prune. What kind of vacation is that? By the time we purchased the cabin, nature had reclaimed most of its original territory. We loved it that way. We could drive an hour away and escape the modern world. Go back to the woods and water. From complexity to simplicity. From manmade to Godmade. The structures of the collapsing arbors were still visible underneath a screen of climbing vines and evergreen trees that grew above, around, and beside them. We totally ignored them. During the past 15 years, they have almost disappeared from sight. We forgot they were there. I have spoken of the lake house before. It is a place rife with emotion for me. Most people who own ”vacation homes” will eventually admit that they are no vacation. You could go to the Ritz in Paris for a month every year and still come out better off. Second homes easily turn into possessive Money Pits. If they involve the use of boats, you might as well stand over the toilet and shred large denomination bills to get an idea of what you’re getting into. If you value your freedom, my advice is just say no. I don’t regret it. Financially, it may not have been the most brilliant investment. My husband always prefers stocks vs. real estate. But it was a significant investment in our family. Our girls were almost 15, 13, and 7. We could see what lay ahead with peer group folly. (We knew from previous personal experience.) “The Laughing Place” was an antidote. An innocence-keeper. A virtue-prolonger. No technology. No cell phones. Even… gasp… No TV! Girls safely in the basement, instead of in someone else’s basement in Athens where the rules weren’t the same as ours. Boyfriends safely sleeping on the pullout sofa in the Great Room… under watch. That tacky little lake house lived up to its name. Our family had some world-class laughs there. Danced til we were dizzy. Ate til we were sick. Tubed and skied and swam and chilled in the hammock and played silly games. Indelible memories were made for us, our children, their friends, boyfriends, and for our extended families. In any case, it made the High School years a more magical time for all of us. If I ever write a book, I’ll explain how everything changed. How one loss came upon the next in such rapid succession that there was no time to recover in between. The lake house became an increasingly infrequent escape. Then there came a day… right smack dab in the middle of other stinging losses… when I drove up and saw that the lot next door had been clear-cut up to our property line. The lots are pie-shaped, on a point in the lake, so that meant that half of what we’d considered “our front yard” was bulldozed to the ground. The bulldozer was still there, touching the corner of our parking pad. The foundation of the new house was just feet away from the back porch. No more drinking coffee in pajamas on the porch swing. The sanctuary no longer was one. I felt completely exposed. I sat on the porch swing in disbelief. Where there had been a canopy of ancient, cool, sheltering trees, there was now a flat barren plain of rough red Georgia dirt. I cried over those gorgeous fallen trees as if they were relatives. It felt like another loss, another death, another end. With the removal of the thick screen of tall trees, the temperature in the house increased substantially. One side was exposed to the beating heat of the western sun. Energy costs mounted. I held a perfect round scuppernong in my hand. I bet it tastes bad, I thought, before popping it in my mouth anyway. It was sweet and delicious. 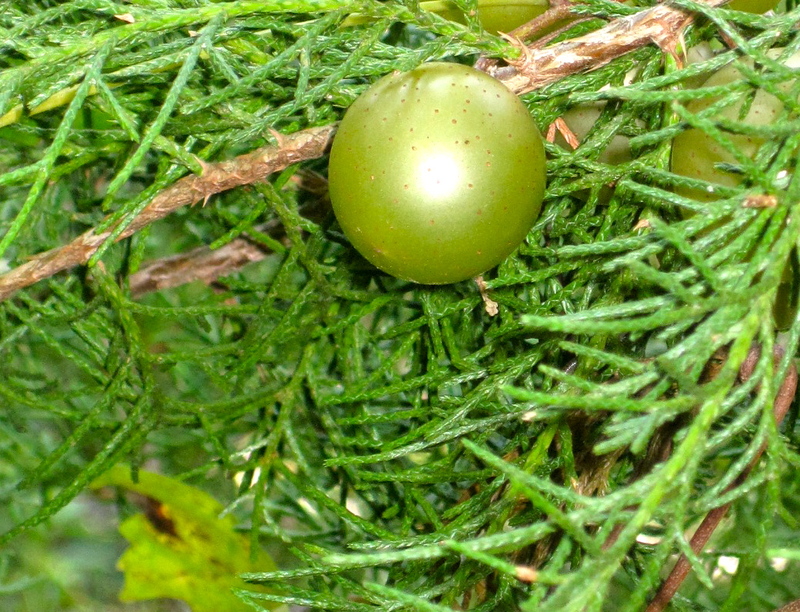 Much better than the sour scuppernongs I remembered from childhood forays with my father. I bet there aren’t any more on these old choked vines. But there were. Hiding among the prickly wild evergreens like shiny round peridots. I got a jumbo-sized gas station cup out of the car and started collecting hidden treasure. I discovered more and more as I moved towards the left through the overgrowth. Towards the west. Towards the side no longer shielded from the heat of the afternoon sun. On that side, there was an abundant harvest of juicy green jewels. I realize, at last, that this is a God-thing. A lesson. Another parable for the spiritually slow. Spell it out, Lord. My ears have been stopped up lately. I have to listen hard. The heat of adversity produces great fruitfulness. It was the heat… the exposure to the light of the sun… that finally caused the tangled old vines to produce the grapes. I chew on that thought all the way back to Athens. It’s not the easy-breezy times. Not when everything’s cool. Not when I’ve got it made in the shade. Not when I’m hiding out from unpleasant realities in my air-conditioned bubble, as I so love to do. It’s when the heat is on that the qualities necessary for fruitfulness are developed. From the fiery furnace of adversity comes a willingness to be used... a desire to share the secrets learned under fire. Self-will and pride are burned away. If we cooperate with the purging process. “A sword is tempered by heating it and then plunging it into cold water. As the room fills with steam and the sword sizzles, the outside molecules of the metal that make up the sword try to move inward while the inside molecules try to move outward putting the metal under tremendous pressure. It is this dynamic tension, this pressure, that gives the sword its strength. Out of the fiery trials of adversity, the Lord wants to produce strong, persevering character in our lives. Oh, how I want to be used in the time I have left. so that I may bear the fruit of your Spirit. Does anyone else feel under fire right now? Have any advice for staying cool in the heat of adversity? There is so much symbolism it all of this. I'd love to hear your thoughts. I feel the same way about trees. Frankly, I think you've been tempered by adversity ENOUGH, but I bet it feels good to have a new perspective. 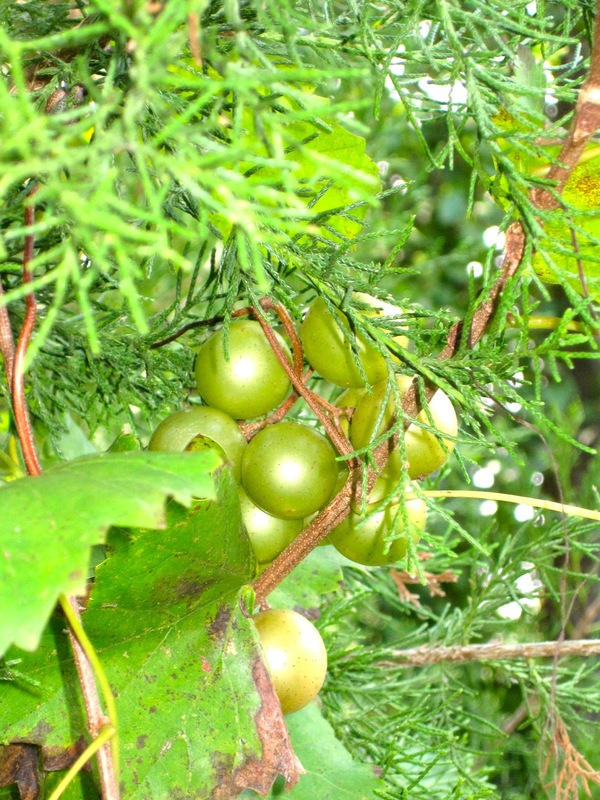 Scuppernongs! Maybe there will be even more, next year. Seems every time I get in the car, I hear, Kelly clarkson's "what doesn't kill you, makes you stronger". That helps. Love your words, hope you write that book. Yep. I feel under fire right now. HARD, wish I had a helmet, and willing to engage a mental health professional to deal with the fallout hard. I can't fix or change things, I'm not sure what to do to nudge them in the right direction, I am up to my armpits in alligators. But one time in the last 6 months I overheard a cell-phone conversation. I did not consider it eavesdropping because the woman on the phone was in a room full of people and made no effort at seeking privacy. You couldn't NOT hear what she was saying. When she got off the phone, I introduced myself. And I told her she had made the right choice. I heard her half, enough to know what she had on her plate, and having been through the same thing, I KNEW she was doing the best thing. For everybody. Her relief at everything, not being alone, knowing someone didn't judge her personally a failure for being in such circumstances, even (and I know how snotty this sounds, but it was true, I could see it) seeing someone on a totally different social level tell her that I knew, I had been there, whatever she felt was valid, how she chose to act on it was the only portion under her control, all those things. My words were a relief, a balm to her. I knew for that second, I was a conduit between God and another person. I was a source of comfort and validation. I wouldn't have been the open receptacle for God's message if I hadn't experienced things I wouldn't wish on anybody. Ever. I'm not happy that I have, I wish no one else ever had to, but I am SO GLAD when I can be the stranger who gets it for another person stumbling though the darkness trying to find their balance. Sometimes the fruit is sour. But the best cobblers are made with the mix of sweet and not-quite-ripe-enough-to-be-less-than-tart-or-sour fruits. And, at the end of the day, I think C. S. Lewis was right. If everything here was great, we might be lulled into thinking that this is the best there is. All shall be well. Maybe not the way we think or plan, but all SHALL be well. This is a great post. i have to say though after just having pipes break in my house, that I am with Brookes. I'll take stocks over property. Sell the sucker and take a vacation! Oh, yes! The heat is on in several aspects of my/my loved ones lives right now, but the blessings are present also. Tonight's Bible reading in the Guthrie Chronological Reading Plan included Daniel 3 also...wow! Guess I was really supposed to, "get" that. My advice: "Read Kim's post and realize you are not alone!" You are so REAL and express my feelings perfectly. ;) Thanks! I tried to post yesterday, but here goes again; I had no idea you were going through even more health problems, along with Money Pit Vacay Home. I know that road. It's supposed to be for relaxation, but all I can recall is how hard I always worked to do the upkeep or clean, decorate. Worth it when other family visited. Sorry I never got to share either home with you, due to so many circumstances. I treasure the time we had there years ago- what a respite for a weary soul, and fun with other friends. health- no easy task. It was well used during your girls' teenage years, and you were so generous to loan it to the church groups.So glad the grapes have put a new perspective in your heart and your neighbors turned out to be lovely. Miss and love you,. Praying for you as always. I don't think I've ever commented, but I was a Chi-O a year ahead of Amie at Ole Miss and worked at Desoto when Grace was a camper. I guess I've met 1/2 of the Arnold girls and hope to meet the other 1/2 some day. Love your blog...read it since you started it and Katherine's blog before that. God has certainly taken you through so much, but you've come through it thus far with such great character and stength. (i know it doesn't always feel that way...thanks for sharing on those days too). Don't quit writing. Very inspiring, encouraging, convicting and a joy to read. Love to your family.